Ensign Peak sits just above Capitol Hill, close enough to hike from the Capitol grounds to the top of the Peak. 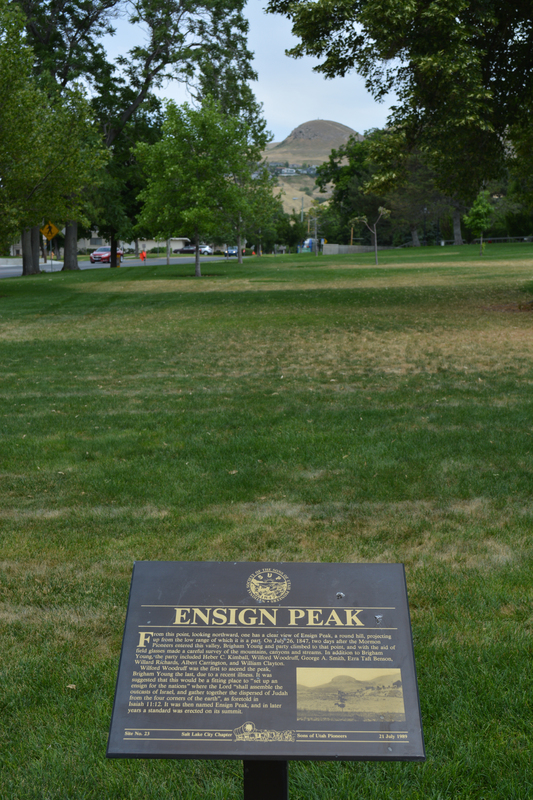 The Capitol erected a plaque for Ensign Peak in July 1989, and from it’s location on the southwest Capitol grounds visitors can see a clear view of Ensign Peak. Ensign Peak became a significant spot in Utah just two days after the pioneers arrived in the valley: July 26, 1847, when Brigham Young and other pioneer leaders hiked the peak to survey the land around them. Wilford Woodruff, the first to reach the peak, recorded his experience: “Using a spy glass we surveyed the valley, stretching out 1,000 feet below us. On the west glistened a large lake. Streams flowing from the eastern canyons, looking like ribbons of willows, emptied into a river which Brigham Young named the Jordan River. We could see sturdy timber in the surrounding mountains with which to build our homes and barns. From this vantage point on top of the peak we began to lay plans for the future city.” Having decided that this is where they would settle, the group raised an ensign, though without a U.S. flag, it is said that they raised one of the men’s yellow bandana’s on a stick. The pioneers did raise a U.S. flag on Ensign Peak as early as October of the same year, despite the fact that the land was still owned by Mexico. The current monument that sits on the peak was erected in 1934.